Results-driven, logical and methodical approach to achieving tasks and objectives; determined and decisive; uses initiative to develop effective solutions to problems; reliable and dependable high personal standards and attention to detail; methodical and rigorous approach to achieving tasks and objectives, persistent, responsible, quick learner, energetic and organized. Identifies and develops opportunities; good strategic appreciation and vision; determined and decisive; uses initiative to meet and resolve challenges. 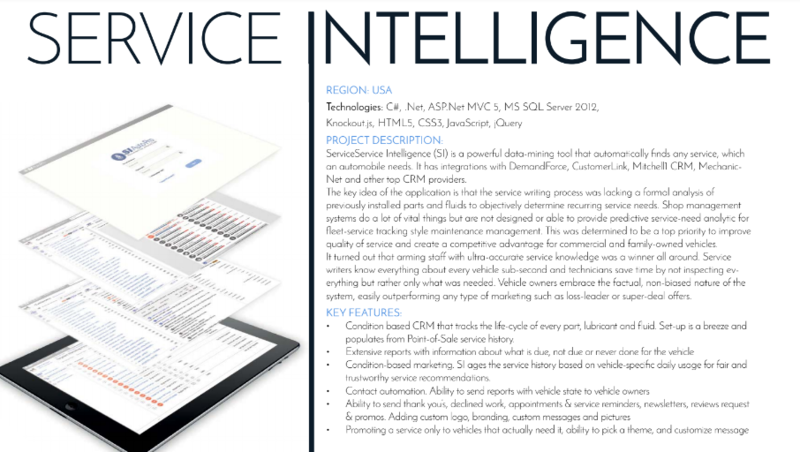 ServiceService Intelligence (SI) is a powerful data-mining tool that automatically finds any service, which an automobile needs. It has integrations with DemandForce, CustomerLink, Mitchell1 CRM, Mechanic-Net and other top CRM providers. The key idea of the application is that the service writing process was lacking a formal analysis of previously installed parts and fluids to objectively determine recurring service needs. 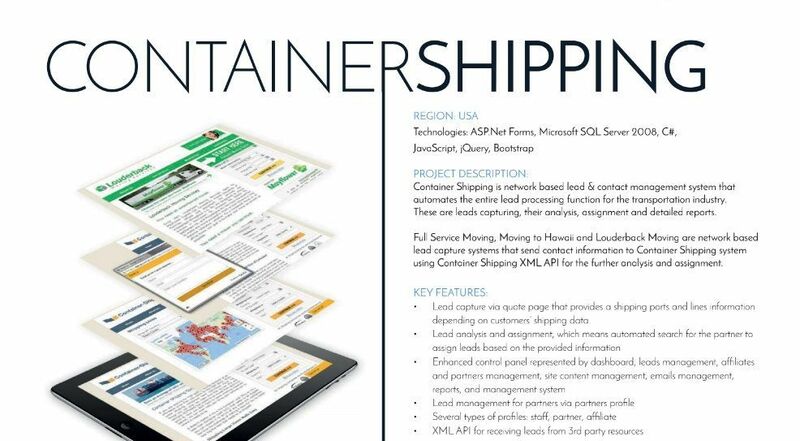 Container Shipping is network based lead & contact management system that automates the entire lead processing function for the transportation industry. These are leads capturing, their analysis, assignment and detailed reports. Full Service Moving, Moving to Hawaii and Louderback Moving are network based lead capture systems that send contact information to Container Shipping system using Container Shipping XML API for the further analysis and assignment.